Antje Boetius receives emails from angry citizens on an almost daily basis. The content of these emails is not always friendly, and not always factual. After all, the scientist works in quite a polarizing field of research: The findings that she and her colleagues publish confirm the massive change in climate that we are currently experiencing, which is causing polar ice and glaciers to melt and sea levels to rise. Her research is therefore shaking the very foundations of our current social structures, our economy and prosperity, and our ethical principles. But scientists have frequently had to deal with opposition over the centuries. The 20th century alone, Hans-Jörg Rheinberge reminded us, was full of hostility. 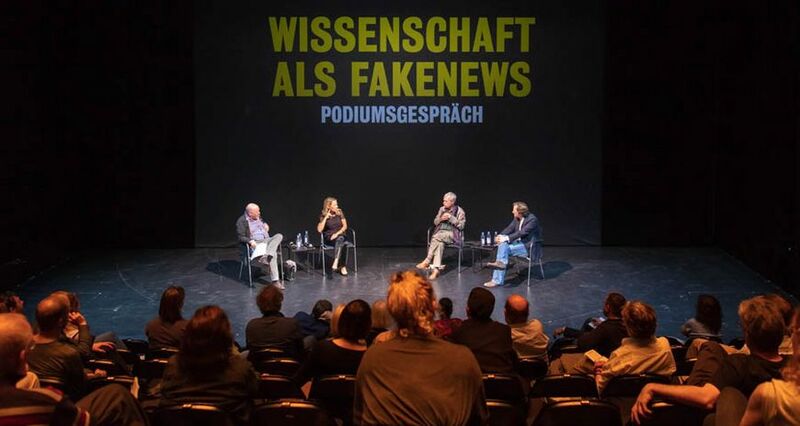 Rheinberge, a historian of science and former director of the Max Planck Institute for the History of Science in Berlin, and Boetius, a marine biologist and director of the Alfred Wegener Institute, Helmholtz Centre for Polar and Marine Research, came together at the Berliner Ensemble theater on Sunday, April 7, 2019 to participate in a panel discussion entitled “Science as fake news.” This conversation formed part of a full afternoon of discussions, workshops, and science slams about distrust and responsibility in science. What is society supposed to do with research results? The question of where resistance to scientific findings comes from was certainly not the only topic the audience wanted to discuss with the panelists. How can we make a difference? Who is responsible? And what triggers a loss of trust in science? These were just some of the questions that the Helmholtz and Max Planck researchers had to address. “Science offers a broad portfolio of possibilities, it addresses problems very clearly,” Boetius said. “We know that global warming can be physically linked to the increase in carbon dioxide emissions. Science communicates these findings to society. But it does not decide which findings will prevail and which will be acted upon.” So naturally, the audience wanted to know: Who bears that responsibility? This question was a thread that ran through the entire afternoon – and was answered in a variety of ways. In a science slam, for example, six early-career scientists each had seven minutes to present their particular field of research in as entertaining a way as possible. Through these presentations, the audience learned how elementary particles are discovered, how mathematics can be turned into a song with the help of a ukulele, and what the invention of the pizza has to do with the invention of improved solar cells. The winner of the slam was Andreas Ofenbauer, who explained how tiny worms can teach us about the identity of our cells. The pros and cons of artificial intelligence was the topic of a talk between bioinformatics expert Uwe Ohler from the Max Delbrück Center for Molecular Medicine and Frank Rieger, a cryptologist, book author, internet activist, and spokesperson of the Chaos Computer Club. Will this field of science advance humankind, or lead us into the abyss? It is not the machines who decide which way it goes, Frank Rieger explained, but the people who program them. The greater the technological advances, the greater the power imbalance. “Fewer and fewer people will have the power to decide how machines interact with other people.” At the same time, Ohler explained, artificial intelligence offers amazing possibilities for data analysis – for example, in medicine. If we use it for the good of society, he added, we could make enormous progress. The question of scientific responsibility was once a research focus for Galileo Galilei. Many of the discoveries made by the Italian polymath in the 17th century were groundbreaking. During the Roman Inquisition, he was forced to retract his scientifically based doubts about the world view of the Catholic Church. The Berliner Ensemble science day therefore closed with a performance of Frank Castorf’s production Galileo Galilei – The Theatre and the Plague. This was a fitting and memorable way to conclude a day that many guests hope to see repeated very soon.